Hi there! My name is Kloish and I'm a Mallow Grundo! 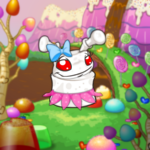 On behalf of all Mallow Grundos, I thought it would be a good idea to give Mallow owners some tips on how to care for such a special type of Neopet. Just becoming a Mallow Grundo is a traumatizing event; there's only two ways to make one of us... zapping with the Lab Ray or dipping in the Rainbow Fountain. Neither is as pleasant as you might believe it to be! If you want to make your adorable Mallow's life exciting, comfortable, and happy, please keep reading, for our sake. There are a few basic things you need to know about caring for a Mallow. Food – This category is the most important to Mallow Grundos. There are certain food items that you just should not feed us. Never, EVER feed us a food item with the word mallow in the title or description! Can you imagine cute little me having to eat a Strawberry Marshmallow Grundo or even a Ghostmallow Smore? That's just cruelty! They look just like my relatives! It's awful that such a food items even exist. Imagine if I was offered hot chocolate and then asked if I need some Marshmallows? That is so insulting! And let's not even talk about campfires. I know that food mallows are not really Neopets but the thought alone makes me cringe. We also strongly dislike food that resembles our friends; fruit Chias. No thank you to the asparagus, carrots, and blueberries! We'll also say no thank you to chocolate. Other than that, we're really not that picky when it comes to food. Grooming- I admit it, taking care of a Mallow Grundo is hard work, especially having to keep us clean. You can't exactly bathe us because we would turn mushy. Therefore shampoo, soap, and rubber ducks are things we'll never be able to enjoy. Don't you dare try to bathe us in hot chocolate either! Perfume – Mallows do smell great naturally, but sometimes we want to take that extra step! Red Blush – for the ladies, it matches the red shade of our eyes and makes us look less pale. Rainbow Toothbrush – you may not always be able to see them, but we do have teeth! The rainbow toothbrush is perfect; we could use a little color in our lives! Every Mallow owner knows that it is surprisingly hard to customize such a cute little squishy Neopet. Maybe these tips will help you! Food/Sweet customizations- I know that you think just because we're delicious little things that means that you can dress us up in all of the chocolate, gingerbread, and pastry items you want... but I'd like to kindly remind you that we like to be treated like normal Neopets too! Friend Tips - As an owner, you need to be extremely careful about who your Mallow Grundo is spending time with. Who to Avoid - Every day that we go out is a threat. Neopets look at me, licking their lips everywhere I go. We especially have to avoid Skeiths and Grarrls. Just the other day I was walking through the Battle Magic shop and the Guardian Grarrl took a snap at me! My owner threw a fit! To avoid 'accidents' like the above situation, make sure that your mallow never goes out alone and you should always avoid scheduling play dates with Grarrls and Skeiths. Most of the other Neopet species seem to be able to control themselves but a Mallow owner should always be wary. Good Friends- Mallows really like Fruit Chias and Chocolate Neopets. These types of Neopets are great friends because they understand how hard life is. We can talk about how we came to be and share our problems. However, we can't really talk to chocolate pets around others. They start to get the wrong idea and it becomes dangerous for both of us, if you know what I mean. Even though we can't really be friends with hungry Neopets, we are actually very friendly. We do need friends or we will become very lonely and sad! You just need to be selective of who we are allowed to hang out with. These are just some other things you should know about caring for a Mallow Grundo. Never let your Mallow go swimming. Red eyes do not mean that your Mallow is evil! Never let your Mallow get too hot. Never let someone make a chocolate Neopet, a Mallow Grundo, and cracker sandwich. Never let your Mallow climb trees (They may become a mallow on a stick!). Never let your Mallow go near those Battledome Chatters (Mallow shooter ammo, anyone?). Keep your Mallow away from fire! Take your Mallow for a visit to the Grundo Space Station every once and a while. Do not keep your Mallow as your active Neopet; sadly baby mallows don't exist! Buy your Mallow nice toys. I hope after reading my guide you now feel like a better Mallow owner or maybe you might even feel like adopting your own Mallow Grundo. Good luck and enjoy your very special and rare Neopet!